When installing the virtual appliance, these guidelines can ensure that a bridge loop does not form. Both physical and virtual appliances bridge traffic. The in-path interface is a bridged connection between the lan0 and wan0 interfaces. The lan0 and wan0 virtual interfaces needs to map to distinct virtual switches and physical interfaces. In other words the lan0 and wan0 should not connect to the same switch. Connecting lan0 and wan0 to the same physical switch requires the switch ports to be configured with two separate VLANS, namely an inside (lan0) and outside (wan0) VLAN and the switch needs to run PVSTP. When deploying on ESX/ESXi, enable promiscuous mode for both vSwitches when using dedicated separate vSwitches. When using only a single vSwitch, but two port groups with separate vlans, only enable promiscuous on the prort group level. Promiscuous mode allows the interfaces to intercept traffic and is enabled through the vSwitch properties in vSphere. 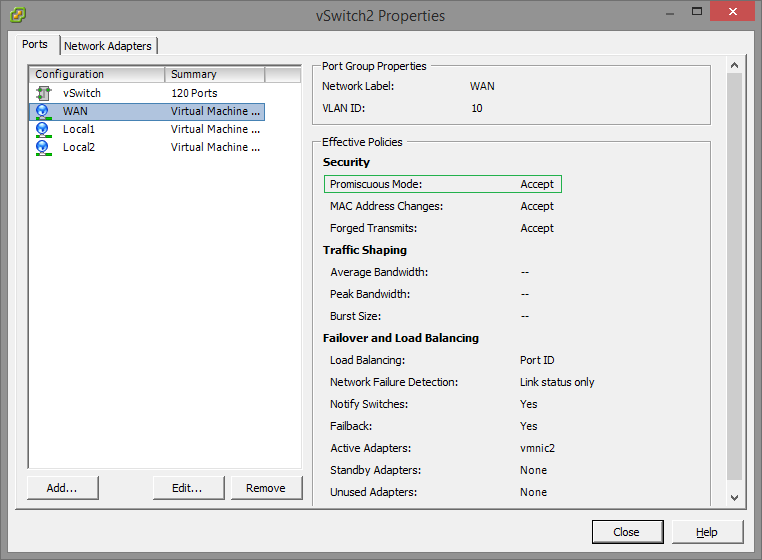 Use distinct port groups for each virtual interface connected to a vSwitch. The OVA package is configured with two virtual interfaces. In the vSphere Client main navigation pane, select the hypervisor host. Select the Configuration tab, Hardware, Networking and then Add Networking. On the Connection Type page ensure Virtual Machine is selected. Click Next. On the Virtual Machines – Network Access page, select an available network adapter e.g. vmnic2. Click Next. On the Virtual Machines – Connection page appears, in the Network Label field, enter wan0 and click Next. On the same screen, next to wan0’s virtual switch, click Properties. On the vSwitch Properties window, select the Port-group and then at the bottom, click Edit. Click the Security tab and then in the Promiscuous Mode drop-down list, select Accept. Click OK. Double check the promiscuous is enabled on Port-Group level. Click Close. In the navigation pane, expand the server, right-click the virtual machine and then Edit Settings. On the Virtual Machine Properties page, click Add. On the Device Type page select Ethernet Adapter. Click Next. Double check the values and click Finish. Important: Never connect the lan0 and wan0 to the same network or Vlan. Use different vSwitches, Port-group and Vlans.